Afflatus – inspiration; an impelling mental force acting from within. Divine communication of knowledge. Aquarius as the fixed air sign holds onto ideas but it can also release them as a flood. This month, the water pourer of this constellation is letting loose inspiration, reminding us that inspiration is the beginning of renewal. This sign’s season is deep winter. Where I live in the upper Midwest, deep winter finds the earth hard-frozen under ice and snow. The seeds and signals of life returning are beginning but I must become quiet to perceive the subtle signs—a change in birdcall, increased moisture in the air, longer days that stimulate more planning and work. If we long for the reawakening of spring, we are naturally drawn to listen for these cues. Opening, silencing the busy mind, becoming receptive, these practices set the stage for Aquarian inspiration, the “afflatus” that Whitman writes about. When Aquarius is strong, opening to inspiration can come too easily. There can be too much information, too much mental stimulation. Does your mind easily become overwhelmed with connections, insights—too much afflatus to be useful? Focus and discernment help to control the flood. This skill will be useful this month. This New Moon in Aquarius is the perfect time to receive inspiration. The Sun and Moon join Neptune and Chiron in a culmination of these two planets’* long journey together. I have been pondering and writing about Neptune, Chiron and Jupiter in Aquarius since April. Although Neptune and Chiron have traveled very closely during this time, this lunar month the conjunction finally becomes exact and only this once. There will be no repeats during this cycle between the two planets. Chiron is shamanic. He is the outsider with healing medicine. He is the healer whose power comes from his own wounds. He is the bridge between polarities. Neptune is the dreammaker. He weaves our consensual reality through shared myths, ideals, and ecstatic experiences. At this moment of inspiration, shamanic insight, and cultural dreaming we are capable of transforming our hearts. The transformation does not require effort; we only need to open and surrender to its flow. The pain and the beauty of Haiti’s tragedy teach us something about all this. There are many levels to the lessons and they are important. The ingress of Jupiter into Pisces last lunar month, joined by Venus and the Sun this month, enlarges our capacity to feel even as it tempts us to deaden the feelings through escapism. There is an ebb and flow to how much we can empathize with others. It is good to be mindful when we have reached our limits and practice healthy ways to replenish. 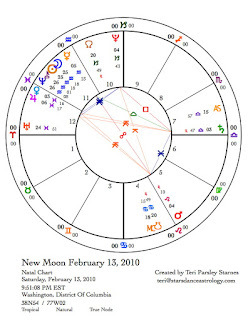 Mars retrograde in Leo plays a significant role in the energy of the New Moon just as it did at the previous Full Moon. Mars is opposite Mercury and is at the apex of a Yod configuration with Pluto and Jupiter forming the base. The quincunx aspects of a Yod carry the energy of challenging paradox. The powerful potential of Jupiter sextile to Pluto (beliefs supporting transformation) can be attained if we integrate contradictory forces rather than fight them. Mars is gathering energy, much like an arrow gathers force as one pulls back on the bow. Mars will be released when it stations direct this lunar month. Mars is in Leo, the sign opposite Aquarius. This fixed fire energy of Leo challenges the Aquarius tendency to be abstract and somewhat disconnected from impact or passion. Mars in Leo wants to act— to be the hero who saves the day. Because Mars is retrograde we are in a period of waiting and frustration, perhaps feeling impotent, without a stage to share all the inspiration we are receiving. That pent-up energy will be released when Mars turns direct on March 10. In anticipation of that release, now is the time to set intention for where you wish it to go. Mercury opposite Mars increases the tendency to say something we may regret or to finally say something that we have needed to say for a long time. There is passionate communication this month. 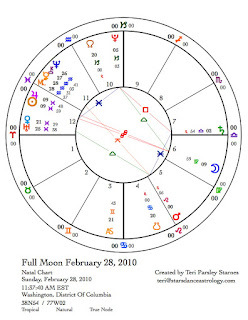 In the Full Moon chart, Mars is stationary, which means it has slowed down and is about to change direction. Intentions of the New Moon will be highly influenced by the desire to integrate the ideals of Pisces and the pragmatism of Virgo. Significantly, Jupiter is conjunct the Sun at the Full Moon. It may be a struggle to remain grounded in the Virgo realm with this incredibly strong Jupiter asking us to feel more deeply and surrender more completely to transcendent states of being. The illumination of the Full Moon may reveal illusions, disappointments, and addictions. It can also reveal higher purpose and reasons to believe. Be ready for both. With so much potential for inspired experience this month, we will be looking for ways to ground the inspiration into manifestation and action. Transits to Saturn this month will support grounding. Venus entering Aries at the end of this lunar month, right before Mars turns direct, will also support our need to act on feelings. When Venus squares Pluto on March 11, actions and passions challenge each other. Somehow, after spending so much time unleashing the floods of inspiration, it may feel good to get down to the nitty gritty of desire. Dates important to the stories. These are not a complete list of transits for the month, but rather are times when the themes of these stories are stronger.